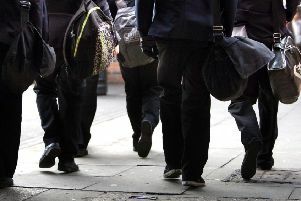 Fire chiefs have been accused of ‘gambling with the safety of children’ over changes to dealing with fires in schools. Under the new plans, which were approved today by the Tyne and Wear Fire and Rescue Authority, firefighters will no longer automatically attend a suspected blaze at any ‘education premises’. Instead, during times when they are expected to be occupied, staff at any school where an automatic fire alarm is triggered would be expected to confirm a fire had actually broken out before emergency services were sent. The decision has been slammed by union bosses. “We know that attendance times have increased across the service and across the country, but what the service is doing will increase it further to any educational establishment. Mr King blamed the need for the decision on cuts to the fire service. Last month, the Tyne and Wear Fire and Rescue Service completed a public consultation on more than £3m in cuts. Similar guidelines for responding to fires is already in place for business premises, but schools are currently exempt - along with hospitals or sites designated a ‘specific high risk premises’. Mr King added: “You are dealing with children, not adults. According to a report prepared for the fire authority, in 2017/18 the brigade received 1,414 ‘unwanted fire signals’ from fire alarms at ‘non-residential premises’, of which 265 came from schools. More than two thirds of these occurred between 8am and 5.59pm – the time frame during which firefighters will now request confirmation from staff before attending. It added that during 2017/18 there were just four fires in ‘education premises’, three of which ‘required no action’. Assistant Chief Officer Alan Robson: “It is the responsibility of the school to have a working fire alarm system. “But we’re also looking for them to confirm the physical signs of fire, as we do with business premises.